Many people are confused by the terms Rattan, Bamboo and Wicker and to us they all may look very similar, so what is the difference? Simply put Rattan is a wood, Bamboo is a grass and Wicker is just the general name for the process of weaving twigs, cane, seagrass, bamboo or other material into a pattern. 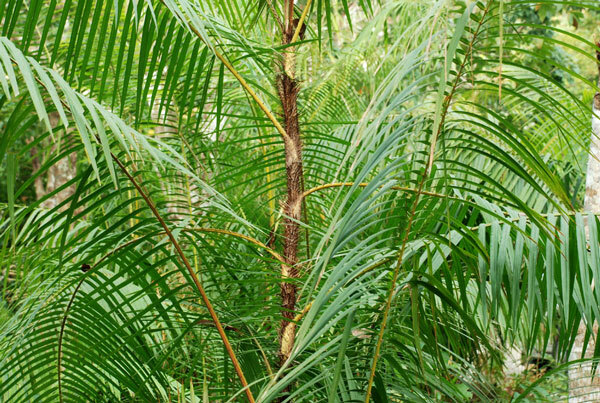 Cane is actually part of the rattan plant itself. It is the outer layer of bark from the Rattan plant that once it has been removed, is processed into strips and used to make baskets, mats and other household and decorative items. Rattan (also known as Manila) is a wood vine (a relative of a South East Asian palm) with a solid core and accepts paint and stain just like any other wood, and provides a long-lasting finish. Some species can grow up to 7cm in diameter. It is a very strong yet lightweight wood that regenerates itself in just 5 to 7 years. A great sustainable option for furniture! It is essentially a tropical palm tree from South East Asia, it is extremely durable and can be steamed and bent into different shapes which make it perfect for the production of furniture – and as a bonus it is virtually indestructible. Bamboo by contrast, is a fast growing grass that is hollow inside. It is still lightweight and strong, and it looks similar to Rattan but with nodules at regular intervals along the length. However it is very brittle and cannot be bent into shapes without cutting away notches and weakening the structure. There are many different diameters depending on the age and species used. Bamboo furniture is usually angular and fairly simple in design and the typical finishes are natural, and ‘burn treated’, but need to be refinished often. Wicker is the weaving process itself. So rattan or bamboo furniture can have wicker details, and the popular Bali-Style furniture using woven seagrass or banana leaf can also be called wicker. This is generally more difficult to keep clean and is much less durable, especially in our rather difficult climate. It can come unraveled, infested, and is easily broken and damaged especially once the humidity gets into it. We have synthetic options available for the outdoors fortunately that have special UV protection. Wicker has been around for a very long time—we will remember that little Moses floated down the Nile in a wicker basket around 1500 BC. Indonesia is one of the largest producers of rattan and it has to be imported as it does not grow here. It is usually manufactured into furniture in the country of origin, or occasionally it is shipped raw and processed into furniture by specialty manufacturers in other locations. Bamboo however, does grow in Costa Rica, although much of what is used for the better furniture tends to be imported. 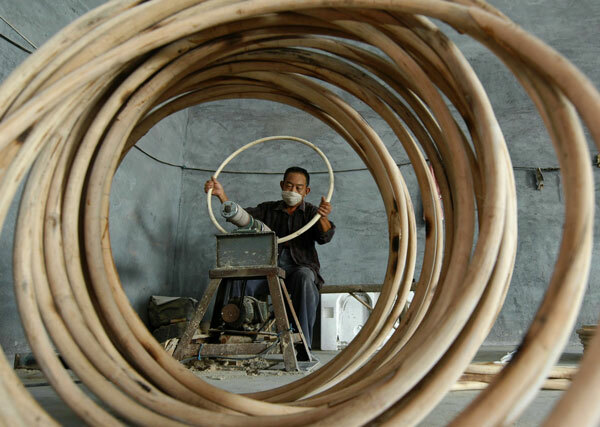 Rattan is actually one of the world’s strongest woods. Initially it grows up, like a tree relying on other trees to grow tall, then it bends back down to the ground like a vine. It does not form concentric rings like most other hardwoods. Straight Rattan is normally bent by means of steaming and once the makers have their desired shape, the wood is hung to dry and remains in that shape forever. Rattan poles and vines are used as the framework for wicker furniture and allow for much creativity in furniture design. It gained popularity in England, Europe & North America during the 1800’s, and Paul Frankl was one of the leading rattan furniture designers in the Art deco period. It had a revival in the 1950’s and 60’s, and has never really lost its appeal in providing an exotic, tropical look in homes and gardens. The best and most durable rattan furniture will have rawhide-bound joints, not cane (which is fragile and will split and unravel over time). For construction the furniture joints are wrapped in the wet rawhide, and when dry they tighten to form a strong permanent binding. That is how you can tell the quality of the rattan furniture you are buying. Leather bound rattan will last for generations. It is also highly sustainable because rattan grows naturally on existing trees and does not disturb the structure and balance in the rainforest. It also produces beneficial CO2. Harvesting the rattan does not require cutting the logging trails into the jungle, and its economic value can actually help protect the forests because it is a valuable crop that depends on trees, rather than replaces them. We love our tropical looking homes, and whether we enjoy a traditional or contemporary style, what better way to enhance that look than using natural materials for our furniture. 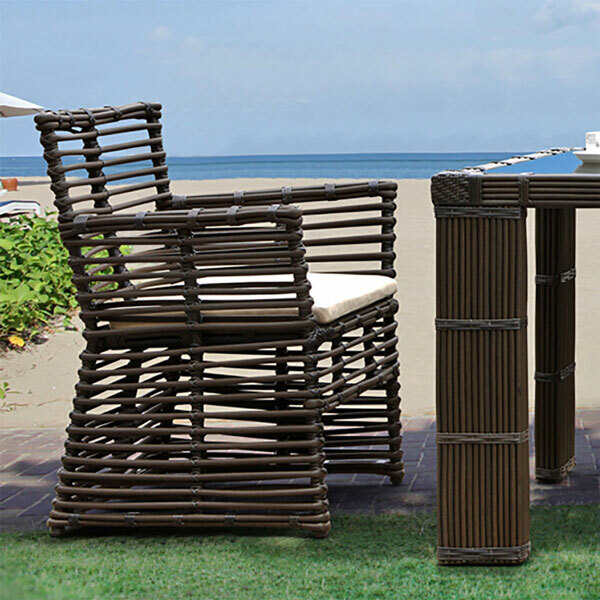 Bamboo and Rattan can offer that to us, as can woven seagrass and banana leaf furniture. As long as we know the differences in these materials and understand the maintenance and durability issues, we are able to make an educated decision when making our furniture purchases.